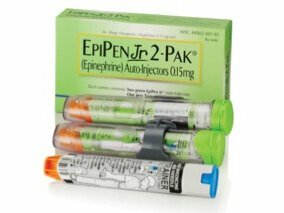 Using EpiPen and EpiPen Jr.
Manufacturers Meridian Medical Technologies Inc., a Pfizer company, manufacturers the pens for Mylan Specialty L.P.
EpiPen and EpiPen Jr. are emergency treatments for sudden and life-threatening allergic reactions. In 2017, Mylan N.V. announced a recall of more than a dozen batches of pens related to a malfunction. The company also faced criticism after several price increases and drug shortages. The FDA approved a generic version of the pen in August 2018. EpiPens are auto-injector devices pre-loaded with epinephrine (also called adrenaline) to treat severe allergic emergencies. These reactions may come from insect bites, food allergies, exercise or unknown triggers. The most serious of these conditions is anaphylaxis, a life-threatening allergic reaction that happens when the immune system overreacts to an allergen. Anaphylaxis can cause drops in blood pressure and difficulty breathing. The medication has been on the United States market in one form or another since 1939, according to the drug’s medication insert. The original EpiPen is for patients who weigh 66 pounds or more, while EpiPen Jr. is for patients who weigh between 33 pounds and 66 pounds. Demand for the medication hits its peak during the start of the school year in August, according to athenahealth, a medical billing and health data company. Schools are required to have a supply on hand, and about 70 percent of these prescriptions go to children who are under 18 years old. Pfizer subsidiary Meridian Medical Technologies manufactures the devices for another drug company, Mylan N.V. Since Mylan bought EpiPen in 2007, it has raised the price from under $100 to over $600 for a set of two injections, according to The New York Times. The company has faced criticism and scrutiny from the government because of drug shortages and overpricing. In 2017, Mylan agreed to pay $465 million to resolve allegations brought by the United States Department of Justice that the company had overcharged the government for its EpiPen. The Justice Department said Mylan misclassified EpiPen as a generic drug to avoid paying rebates. The company sells an “authorized generic” version of EpiPen, which is actually the same pen but in unbranded packaging. In August 2018, the U.S. Food and Drug Administration approved the first real generic version of the drug, which Teva Pharmaceuticals will manufacture. Because there are not many controlled clinical trials that assess using epinephrine for anaphylaxis, no one knows the actual rate of side effects, according to the drug’s label. But some common side effects seen in existing literature include anxiety, restlessness, heart palpitations, headaches and nausea. Many of these typically go away after a patient rests or lies down for a while, according to Mylan’s EpiPen website. But Mylan has previously recalled the auto-injectors because of malfunctions. 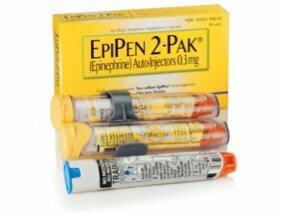 Using the EpiPen or EpiPen Jr.
Each EpiPen contains a single dose of epinephrine to be used once. The patient’s weight determines the dose. Health providers prescribe 0.3 mg for people who weigh 66 pounds or more and 0.15 mg for people who weigh between 33 pounds and 66 pounds. If a patient needs a lower dose than 0.15 mg, the medication insert recommends using another type of injectable epinephrine. 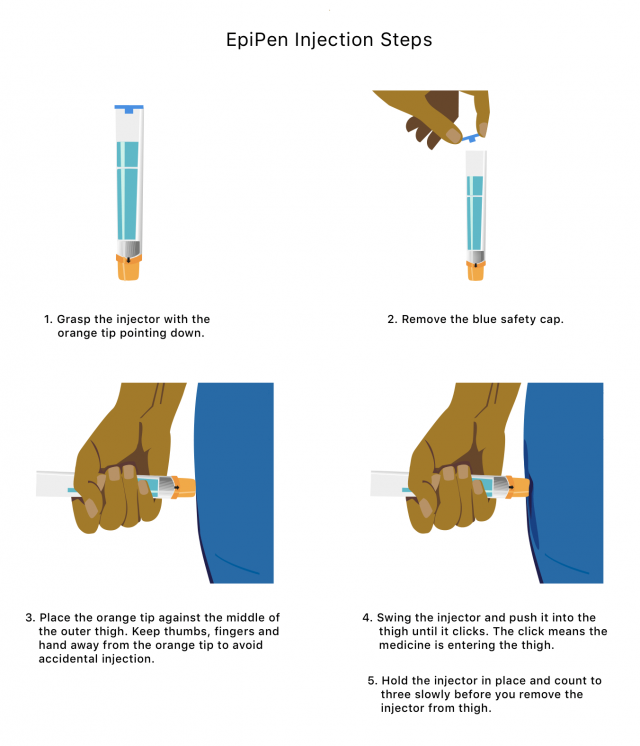 Instructions for EpiPen use come with each auto-injector package. 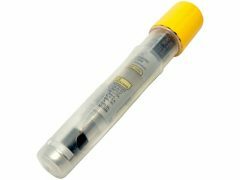 Each auto-injector comes in a clear carrying tube. Before use, patients or people administering the medicine to young children need to remove the pen from the tube. Inject EpiPen into the middle of the outer thigh, through clothing if necessary. Before an emergency occurs, patients and adults administering to children should practice using the pen. Mylan provides an empty, needleless training injector marked “Trainer” with each pack of EpiPens for people to practice injecting the medicine. Although the epinephrine injection may stop an emergency reaction, it does not replace medical attention. Patients should call 911, see their doctor or go to the emergency room immediately after using the pen. In some cases, patients may need a second injection. EpiPen instructions say it is safe to administer a second injection five to fifteen minutes after the first. But people should not have more than two injections right after one another without medical supervision. Overdoses may cause symptoms such as difficulty breathing or irregular heartbeat. Patients may also suffer stroke, high blood pressure or death. Seek medical attention right away in the case of a possible overdose. EpiPen is effective at stopping life-threatening allergies, and there are no listed contraindications. However, the medication insert lists a few things to look out for when using the auto-injectors. Using pens intravenously or in the buttocks, fingers, hands or feet can cause serious reactions or change the effectiveness of the medication. For example, intravenous use can cause cranial hemorrhages, and the medication will not work properly if injected into the buttocks. Rare skin infections have occurred. Bacteria on the skin at the time of injection may be responsible. An alcohol swab may reduce the risk of infection, but alcohol doesn’t kill all types of microorganisms. Avoid injecting pens into the buttocks to reduce risk. Even without an official contraindication, Mylan does caution that some patients are at greater risk for adverse reactions. People with heart disease, arrhythmias, hypertension or people who take drugs that may create arrhythmias may be at greater risk of chest pain or ventricular arrhythmias after using EpiPen. Other conditions that may affect how people react to epinephrine include diabetes, pregnancy, hyperthyroidism, Parkinson’s disease or advanced age. Epinephrine may interact with several drugs and make its effects stronger or weaker. These include heart medications, antidepressants, beta-adrenergic blocking drugs (propranolol), alpha-adrenergic blocking drugs (phentolamine) and ergot alkaloids (dihydroergotamine, ergotamine). In March 2017, Meridian recalled 80,000 EpiPens sold around the world. A week after the initial recall, Mylan announced that Meridian had recalled thousands more EpiPens that had been distributed in the United States. The recalls were announced after reports that a defective part could cause them to malfunction. “While the number of reported failures is small, EpiPen products that potentially contain a defective part are being recalled because of the potential for life-threatening risk if a severe allergic reaction goes untreated,” the FDA said in its news release. In the United States, 13 lots of EpiPen and EpiPen Jr. devices were included in the recall. The companies distributed the pens between December 2016 and July 2017. The expiration dates on the affected devices ranged from April 2017 to October 2017. The FDA also called on consumers and health care professionals to report any EpiPen malfunctions or complications from the devices to its MedWatch program. While the FDA news release did not mention any adverse events related to these failures, Bloomberg reported seven deaths occurred in connection with failures from January 2017 to September 2017. Reports from the same period showed another 228 people were hospitalized after their EpiPen or EpiPen Jr. failed. The FDA Adverse Events Reporting System (FAERS) Public Dashboard shows reports of EpiPen complications more than doubled between 2016 and 2017. In September 2017, the FDA sent Meridian a warning letter, citing the company for failing to appropriately investigate hundreds of complaints of EpiPen malfunctions.